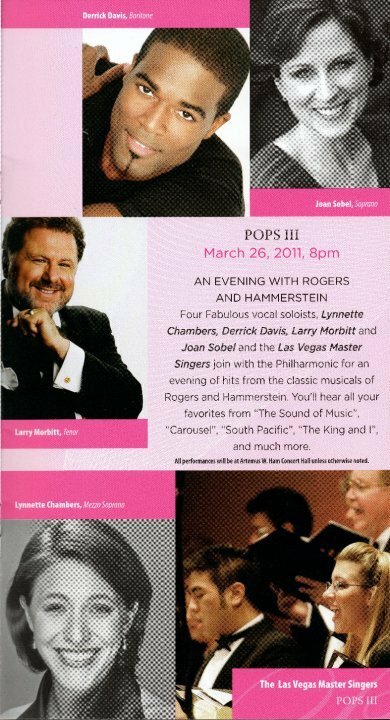 Las Vegas Philharmonic "An Evening with Rodgers and Hammerstein"
The Las Vegas Philharmonic‘s “An Evening with Rodgers and Hammerstein” was a rousing, touching and aurally-inspiring event, full of quality musicianship, talented singing and ideal performances. The program featured diverse selections from Carousel, The King and I, and The Sound of Music, including instrumentals such as the “The Carousel Waltz” and vocalist solos and duets ranging from love songs to uptempo numbers. Each guest singer sang with conviction, passion and gorgeous tones. Their voices caressed the lyrics, and transported the audience to the romance and unique storylines of the classic musicals. Each singer’s voice soared beautifully above, around and through the music. In the duets, the voices and music intertwined and blossomed into glorious gardens of harmony. The Las Vegas Master Singers was a beautifully blended chorus, singing precisely yet with greatly developed feeling. Music Director and Conductor David Itkin explained the significance of the work of Rodgers and Hammerstein within the context of American musical theater and American culture, which gave deeper appreciation for each piece and its performance and created a personal connection with the audience. Derrick Davis (baritone), a singer from the cast of Disney’s The Lion King at Mandalay Bay, performed the first solo, backed by the Las Vegas Master Singers. His deep, resonating vocal quality conveyed both warmth and excitement. The other featured vocalists included Joan Sobel (soprano) and Larry Wayne Morbitt (tenor) from The Phantom of the Opera (Las Vegas) and Lynette Chambers (mezzo alto), a professor of voice from Hardin-Simmons University in Abilene, Texas. All graced the event with superb vocal tones and emotion. The prodigious talent on display in this performance is very heartening to any follower of culture in Las Vegas. The Philharmonic orchestra was as refined and powerful as the Boston Pops — perfection in concert. Las Vegans, you’ve got all the culture you could ask for right here in Sin City, starting with our own Philharmonic.